The process of globalization is facilitated by three major organizations, i.e. World Bank, World Trade Organization (WTO) and International Monetary Fund (IMF). There is a little bit of bewilderment and confusion, in the mind of many people regarding the IMF and World Bank regarding their functions, objectives, structure, member nations, etc. The fundamental difference between IMF and World Bank is that the bank is established as a development organization whereas the fund is founded as a cooperative organization. World Bank provides financial and technical aid to the developing nations of the world. On the other hand, IMF is formed to promote financial stability, international trade, high employment, reduce poverty and so on. 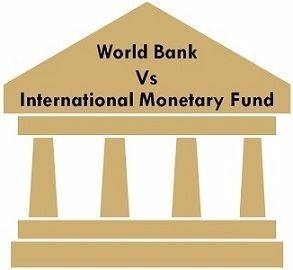 Here, in this article we have explained the difference between world bank and IMF, take a read. Meaning An international organization maintaining the global monetary system is the International Monetary Fund. A global organization established to finance and advice the developing nations, in order to make them economically developed is World Bank. Organizational Structure It is a single organization with four credit lines. It has two major institutions, namely International Bank for Reconstruction and Development (IBRD) and the International Development Association (IDA). Objective To deal with all the issues related to the financial sector and macroeconomics. To lessen poverty and promote the long term development of the economy. The International Monetary Fund is a Bretton Woods Institution, founded in the year 1944, based in Washington, D.C., USA. The IMF is an autonomous body which began its operations in 1947. At its inception, the member countries were only 31 which has been exceeded to 188 countries. The fund is a unitary organisation, affiliated with the United Nation Organization (UNO). The IMF provides concessional and non-concessional lending to its member nations. The main function of the IMF is to look after the international monetary system, bring financial stability, encourage world trade, reduce poverty, generate employment and stimulate sustainable growth of the economy. In 2012, the area of operation of the IMF was extended and now, it oversees all the matters relating to macroeconomics and finance. The member nations contribute finance to the fund, in a fixed quota which is decided according to their national income and international trade. The quota is taken as a base to determine the borrowing rights and voting power of the country. All these institutions are collectively known as the World Bank Group, however, IBRD and IDA are the two arms which constitute the World Bank. World Bank is a part of the World Bank Group and a member organization of the United Nation Development Group as well. At present, there are 188 member countries of IBRD and 172 member countries of IDA. It was initially established, to help the economies suffering due to World War-II in development, but later on, it aimed to help the underdeveloped member countries in becoming developed. The International Monetary Fund is a controller of the world’s monetary system. World Bank is a global financial institution. The IMF focuses on bringing economic stability, whereas the World Bank laid emphasis on economic growth of the developing nations. The size of the World Bank is more than three times larger than the size of the International Monetary Fund. The International Monetary Organization is a unitary organization while the World Bank is bilateral organization. At present, there are 188 member countries of the IMF, but if we talk about world bank, it has 188 member countries of IBRD and 172 member countries of IDA. International Monetary Fund came into existence to provide advice and assistance. Conversely, the World Bank is created to facilitate lending. The major objective of the IMF is to deal with matters related to the financial sector and macroeconomics. On the other hand, the purpose of the World Bank is to reduce poverty and to promote economic development. The IMF and World Bank are the two Bretton Woods Institution, formed in 1944. There are many things in common, in these two international organizations. Both of them supports the international monetary and economic system. Almost all the countries of the world are the members of these two organizations.